It might be hard to believe but Penhydd was a bit of an accident, a test track that went wrong and grew into a layout. Experimentation was very much the name of the game when I started the project. The idea being to evaluate different track underlays, various flexible track systems, auto couplings, slow action point motors, Silflor grass mats, and a photo back scene. Quiet a list when I think about it, the only problem that I encountered was in getting carried away with things, and before I knew it I had a layout! So where did it all go wrong, and why did I end up dismantling the it? Well having progressed from a simple circular train set I had started to build end to end layouts, and after years of operating trains between a small branch line termini and fiddle yard I was getting bored. Perhaps that is why I began to lose interest in operating, then again friends have suggested that it might be an age thing? Anyway one thing was certain I needed a fresh approach, and a new challenge. In an attempt to rekindle my interest I constructed the creamery, which seemed to be a good idea at the time, but in fact it proved pointless. True, it was an interesting and enjoyable build, but it added little to the layout. To be honest I might have well continued to trip milk tanks to the fiddle yard and back, which is where the creamery was supposedly located as an off stage industry. The creamery with its motley collection of buildings hid a single cassette deck. Fine for the sort of limited operation that I was beginning to favour, but not really practical for a more extensive service. This was one experiment that failed, what I should have done was to wrap the back scene around the cassette deck to give a feeling of openness, and simply modelled the creamery chimney, the top of the water tower and perhaps a roof or two, which would have given a hint of what lay beyond the road bridge in the opening photo. The rest being left to the imagination, oh well, you live and learn………. The trouble is, I’m first and foremost a layout builder, and couldn’t resist putting a part of the bare cassette deck to good use. On top of that my interests were beginning to change, the appeal of three coach passenger trains, shunting and having an example of each of my favourite locomotives began to fall flat. There was a time when I felt that a 45XX ,or two was essential motive power for a WR branch, but 4560 began to see less use, for it didn’t look right at Penhydd. The lack of chairs on the pointwork didn’t bother me, as their omission wasn’t really noticeable on the layout, unlike in a photograph! Anyway I had a selection of copper clad points in store, which had been built for a previous layout. Most of my locomotives never saw the light of day as I was content to operate Penhydd with 1455 and 4678. In short the penny was finally beginning to drop, and the argument about less being more was growing stronger by the day. The discovery of a rare photo showing 7416 at Presteign with a single passenger coach really caught my imagination, it just looked right, and so different from the usual auto-trailer which is so often modelled. 1455 leaves Penhydd with a late evening train for Titley Junction. Now this is my sort of train, not only is it pleasing to my eye, but its prototypical and looked rather lost on Penhydd. The truth is, small layouts look far better with short trains, they made the layout looked longer than it actually was, and that started me thinking. 1455 again but on a goods train similar to those featured in some of Ben Ashworth’s lovely photos. By this time Penhydd was being operated as one engine in steam, with Pannier 4678 as reserve. Now I might be wrong, but I’m pretty sure that having two dedicated branch engines helped give the layout a feeling of place. Both were, and still are lovely smooth running engines that start first time and glide around the layout reliably and quietly. Well that’s assuming they are maintained correctly, easy to do when you only have two loco’s to clean and service. This scene could have been completely different, for I had a seascape in mind. The underbridge would have provided access to a promenade, shades of Grange-0ver- Sands on the former Furness Railway. 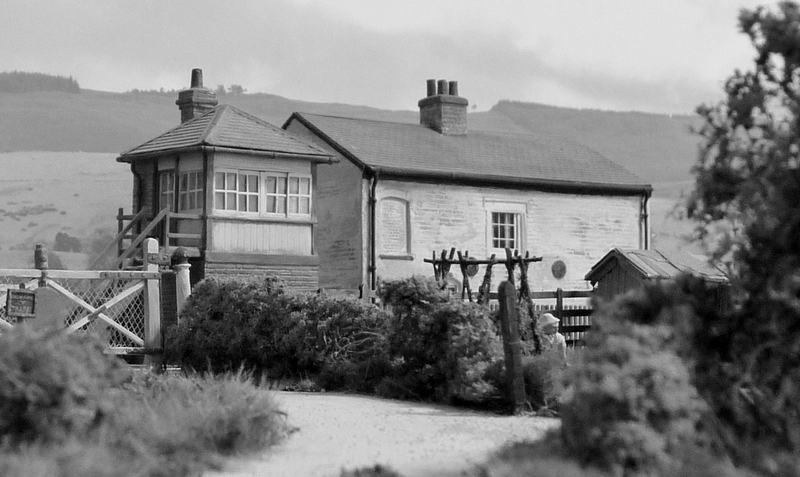 However I decided to model something different from the usual GWR seaside branch, which has been done to the death. Penhydd was meant to be different in as many ways as possible, no chocolate box setting, or pristine stock. For I set out to portray the other side of the Western, the one that I knew and loved, which was far removed from the publicity departments posters. So filthy rusting Pannier, and other tank engines reigned supreme. Hauling equally run down, life expired passenger coaches and goods stock, along a neglected country branch that was on its last legs. To add a little variety a Class 121 dmu was used on some services to reflect the changes that took place towards the end of steam. An NBL Type 2 was also pressed into service on goods trains from time to time, but more often than not was seen in charge of a rake of milk tanks. A new NBL Type 2 with a rake of heavy milk tanks at Penhydd, by now the branch was on borrowed time, the creamery providing a brief stay of execution. By now I was thinking of building a diorama or two, ideas were pondered then dismissed. I kept looking at Penhydd and began to find all sorts of faults with it, hoping to find an excuse to dismantle it and start all over again. It was the thought off, rather than the act of dismantling that bothered me. Unable to come to a firm decision I started to plan a small diorama, and as it began to take shape I kept eyeing the space that Penhydd was taking up. The end, none of the track could be salvaged, the station building, the fire buckets and drum live on. Some grass tufts and foliage ended up on Llangunllo, as did the baseboard frames. Then one afternoon I started to lift the track, the buildings were salvaged along with some scenery, and the electrics. In fact anything that could be used again was carefully stored away, the items might never see light of day on a new layout, but can come in handy for planning projects, or be reworked into something completely different. Do I have any regrets, well the answer has to be a firm no. Penhydd taught me a lot, was the first layout that I ever completed, which was no doubt down to its simple compact nature. More importantly it set the scene for my future modelling projects.